The core commercial area of Hillsborough Street developed to serve the needs of North Carolina State University students, and fell short of the needs of local neighborhood residents. As tension between students and residents developed around this imbalance; late night noise, poor lighting, and traffic along Hillsborough Street only made things worse. In 1997, public outcry over a pedestrian fatality galvanized a group of community leaders to step forward. These leaders created a neighborhood alliance that organized a design charrette, to gather community concerns. High pedestrian crash rates, traffic congestion, a lack of on-street parking, and a lack of bicycle infrastructure were all listed as priority issues along the corridor. One of Raleigh’s oldest historic neighborhoods was revitalized through a unified approach to a road diet and streetscape improvements along Hillsborough Street. Using the streetscape improvements as a springboard for affecting change, city, neighborhood and university leaders addressed issues of traffic safety, neighborhood character, and ways to accommodate all using the roadway, sidewalks, and adjacent land uses. Described in the Hillsborough Street Redesign Plan as “the only thoroughfare functioning in its original uninterrupted design outward from the Capitol,” Hillsborough Street as a community asset was not meeting all needs. Figure 2. A concept design for improvements along Hillsborough Street, taken from the 2001 feasibility study. The finalized plans included medians for traffic calming and the roundabout proposed for Oberlin Road.Credit: Kimley-Horn & Associates, Inc. The project area study area forms the northern boundary of NC State’s Main Campus, bordering two historic neighborhoods and representing a variety of single family residential and student housing uses. A string of local restaurants and pubs have historically catered to NC State’s student body, despite the frustrations of area residents over a lack of amenities. Commuters use the four-lane facility to gain easy access to downtown, resulting in high crash rates and frequent speeding along the corridor. Area residents take pride in their neighborhood’s historic character, but are likewise dismayed at the decline they perceive throughout the corridor. The 1997 pedestrian fatality started a string of events that resulted in a redesign of the street’s cross-section, as well as the community’s livability. The 2001 Feasibility Study/Conceptual Plans for the Reconstruction of Hillsborough Street covering .7 miles between Pullen Road and Bagwell Avenue was the result of two years of intensive work that began with the Hillsborough Street Charrette. The goal of the project was two-fold: increase safety for all travelers, while also transforming Hillsborough Street from a thoroughfare for downtown commuters into a destination street for families, students, and tourists. Heavy foot traffic along the busy 4-lane arterial roadway created routine friction among motorists, students, and local homeowners, but by the mid 1990’s development pressures threatened to push Hillsborough Street beyond its daily roadway capacity. In 1997, a pedestrian fatality galvanized a group of community members to advocate for safety improvements along Hillsborough Street between Gardner Street and Oberlin Road. Represented by local leader Nina Szlosberg, the Hillsborough Neighborhood Coalition set out to create a strategy for improving safety, aesthetics, and economic vitality along Hillsborough Street. 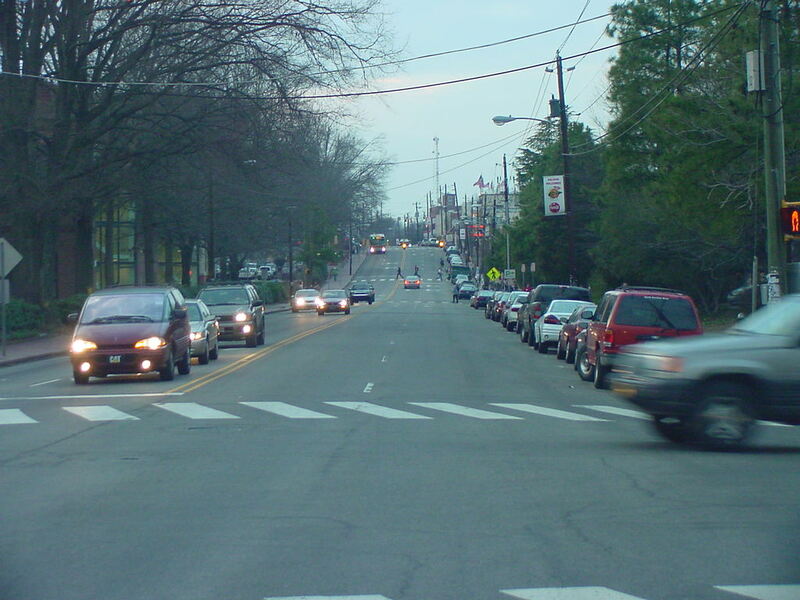 In 1999, a design charrette called the “Hillsborough Street redesign project” brought together leaders from NCDOT and the City of Raleigh to participate alongside NC State University, Hillsborough Streets Merchants Association and the University Park Homeowners Association over a weeklong series of meetings. The meetings were led by nationally-recognized transportation planning consultant Dan Burden, who recommended roundabouts at Pullen Street and Oberlin Street to smooth the flow of traffic, slowing motorists from 35mph to 15-20mph at all approaches to the traffic circles. The charrette reaffirmed the Hillsborough Neighborhood Coalition’s advocacy towards a new Hillsborough Street corridor, and in December 2000 the City hired Kimley-Horn & Associates to produce a feasibility report for improvements along Hillsborough Street. The 104-page report distilled public input and existing conditions in the area to create a unified community vision for the improvements, and by July the following year the project received approval from City Council. Recommendations from the study included a two-lane divided facility with sidewalk bulb-outs and roundabouts at intersections, as well as street furniture and a reconsideration of pedestrian crossing placements in accordance with the Physical Master Plan for NC State University. Using this phased approach, Transportation Planning Manager Eric Lamb recounts, the City and North Carolina State University constructed a roundabout at the intersection of Pullen Road and Stinson Drive in 2003. Considered by Lamb and others as “Project Phase Zero”, the project was well-received by the community, and was considered a proof of concept for the larger package of improvements. Despite this success, however, the project stalled towards the end of 2003 after being submitted to NEPA, when an environmental impact study showed it had no significant negative effects. Having already accrued $3.3 million in funding, the discussion turned towards which of the project’s elements could be done away with, but local leaders fought for more funding through the City’s Transportation Bond referendum and a separate Certificate of Participation bond. The combined efforts raised an additional $9.92 million, and the project was slated to move forward in 2009. In July 2009, City Council formed the Hillsborough Street Community Service District and contracted the newly incorporated Hillsborough Street Community Services Corporation to manage it. Phase 1 improvements included the addition of two roundabouts at Oberlin Road and Pullen Road, while Phase2 included the road’s restriping from a four to two-lane facility, the median additions, and streetscape improvements. Completed in 2010, the new street layout would accommodate on-street parking on both sides, adding new sidewalks and bright LED lighting as added security for pedestrians at night. Notably, the initial improvements did not include bike lanes, which were later added with recommendations taken from NACTO’s Urban Bikeway Design Guide. The total cost for Phases 1 and 2 was $9.22 million. A 2012 crash data analysis indicated a 23% overall reduction in crashes post construction. 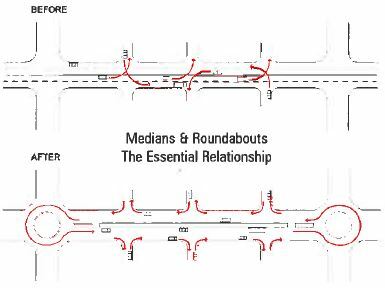 Each subsection of the study area saw a reduction in crashes, except for the roundabout at Pullen Road. NCDOT engineers responded to the increasing crashes and the Pullen roundabout was modified from a double-lane to a single-lane facility in July 2012, bringing crash rates back down. The improvements along Hillsborough Street have changed interactions between motorists and pedestrians, slowing down motorists and encouraging higher frequencies of pedestrian traffic. Operating speeds have been reduced in the vicinity of the roundabouts, and the decreased traffic volumes during construction have not returned since the project’s completion. The Hillsborough Street Partnership’s efforts are now focused on a “clean and safe” street program to address street image problems and attract new investment to the area. The project’s 3rd phase includes plans to expand streetscape elements westward to Faircloth Street. 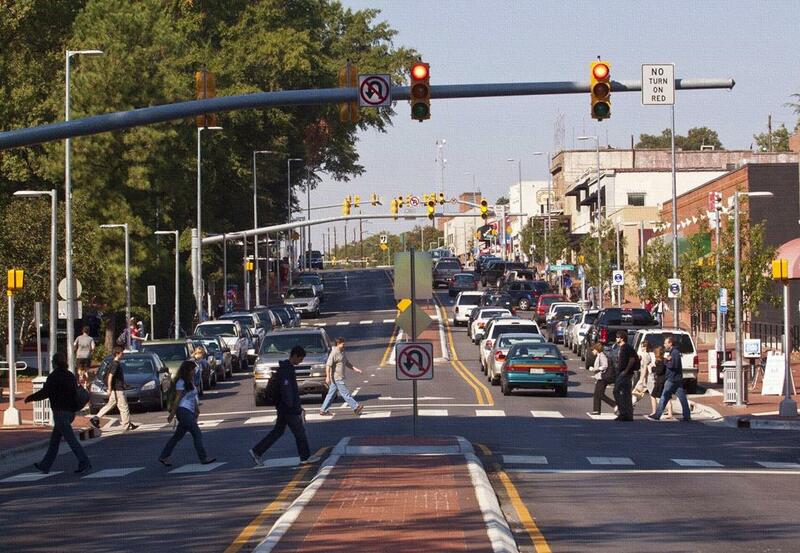 An updated vision for the corridor is forthcoming in 2015. Chapman, G. (2014, July 24). Discussion of Hillsborough Street Revitalization Project. Henderson, R., Wilson, J., Rushing, M., Dunzo, M., Dalton, R., Whyte, D., … Wilder, S. (2001). 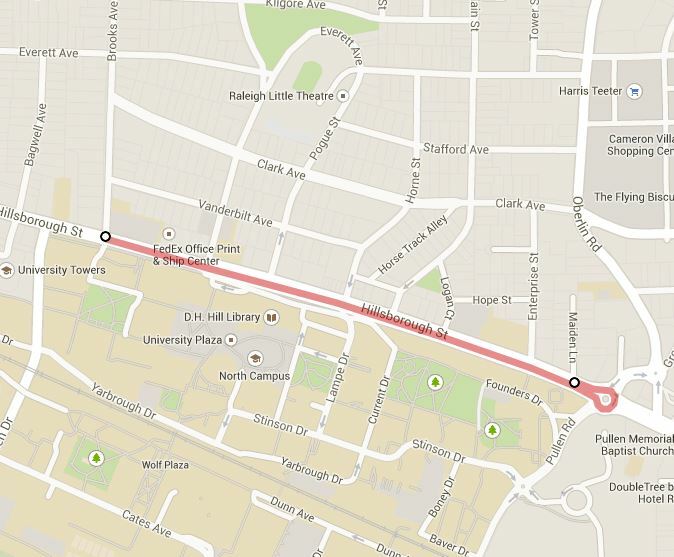 Feasibility study/conceptual plan for reconstruction of hillsborough street. Kimley-Horn & Associates, Inc. Retrieved from: http://www.hillsboroughstreet.org/_files/docs/hillsborough-st-feasibility-study.pdf. Hillsborough Street District BID Formation Study Report. (2008, May). Retrieved from http://www.hillsboroughstreet.org/_files/docs/hillsborough_finalreport_061608.pdf. Kelly, B. and Lamb, E. (2014). Hillsborough Street Pedestrian Safety Assessment [PowerPoint slides]. City of Raleigh, Office of Transportation Planning. Kirkpatrick, J. (2013, September 10). A History of Raleigh Transportation Bond Projects. City of Raleigh Public Affairs Department. Lamb, E. (2014, July 15). Discussion of Hillsborough Street Revitalization Project. U.S. Department of Transportation, Federal Highway Administration. Raleigh, North Carolina- Hillsborough Street Improvement Project. Retrieved from: http://www.fhwa.dot.gov/livability/case_studies/guidebook/appendix/app13.cfm.